Zero Grams of Trans Fat! 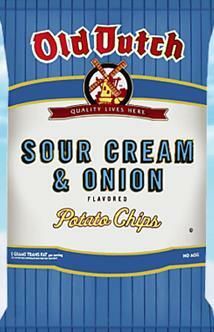 Old Dutch classic Sour Cream & Onion Potato Chips combine zesty and creamy flavors for a tastiness that delivers every time. They're crispy, satisfying, and simply delicious. Ingredients: Potatoes, Sunflower Oil and/or Canola Oil, Whey Powder, Contains Two Percent or Less of: Salt, Lactose, High Oleic Sunflower Oil, Onion Powder, Dry Buttermilk, Sour Cream Powder(Cultured Cream, Nonfat Milk), Salt, Sugar, Yeast Extract, Parsley, Citric Acid, Disodium Phosphate, Natural Flavor, Toasted Onion Powder. Contains: Milk.